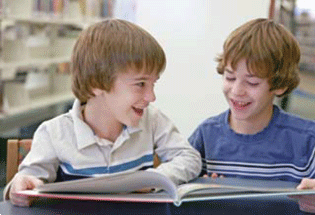 Students learn to write by reading models and receiving explicit skill instruction. 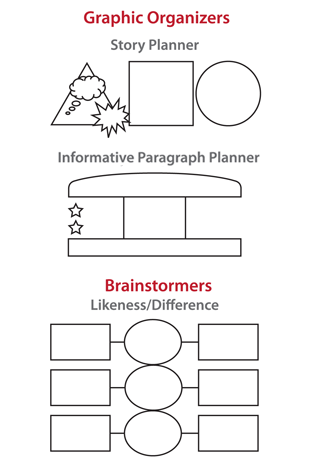 Not only does reading supply the information that writers need, but reading also develops awareness of what writing is supposed to look like. Writing style is a special kind of language. Unlike speech, writing involves conventions such as spelling, punctuation, the creation of complete sentences, sentence variation and certain expressions and sentence structures heard rarely in speech but seen often in written text (Benjamin, Hugelmeyer 92). Readers may become better readers by reading more, but writers do not become better writers by writing alone. Since language is acquired “from input, not output, from comprehension, not production” (Krashen136), the reason we cannot learn writing by simply writing more makes sense. explicit instruction in sentence building and writer’s craft. Writing Alive provides these. Andrade, Du and Wang (2008) investigated the effects of having third and fourth graders read an assignment, set goals and use rubrics to self-assess the quality of the written work they produced. A comparison group brainstormed criteria and self-assessed their drafts but did not use the rubric. The group that used the rubrics for self assessment wrote better overall and specifically in the areas of ideas, organization, voice and word choice. However, there was no difference in conventions. Andrade, Du and Mycek (2010) duplicated these findings with students in fifth, sixth and seventh grade using a rubric. The rubric group’s writing was evaluated as having higher quality on all six criteria. – Andrade, H.L. Du, Y.,Mycek, K. Putting Rubrics to the Test: The effect of a model, criteria generation and rubric-referenced self-assessment on elementary students’ writing. Educational Measurement: Issues and Practice, 27(2), 3-13, 2008. Steve Graham, Ed. D. in his January 2013 white paper, “It All Starts Here: Fixing Our National Writing Crisis from the Foundation,” published by Saperstein Associates, analyzes the writing crisis in the United States. Using research from over 50 sources, he recommends a plan to provide students with comprehensive writing instruction. 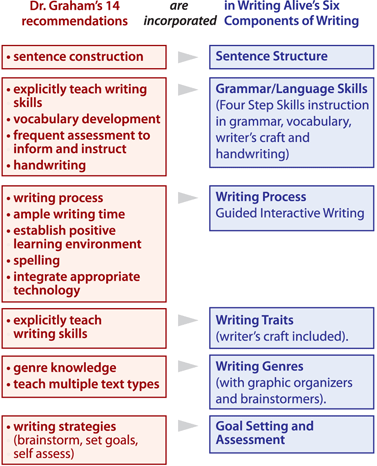 The Writing Alive writing curriculum addresses and/or teaches all fourteen of these strategies (while spelling is addressed, it is not taught in depth with spelling patterns). Dr Graham is correct. When a writing curriculum employs all these strategies, students are successful, confident writers and test scores improve. Read Dr. Steve Graham’s full report. The fourteen point solution is outlined on pages 5-7. Click here for the full report.